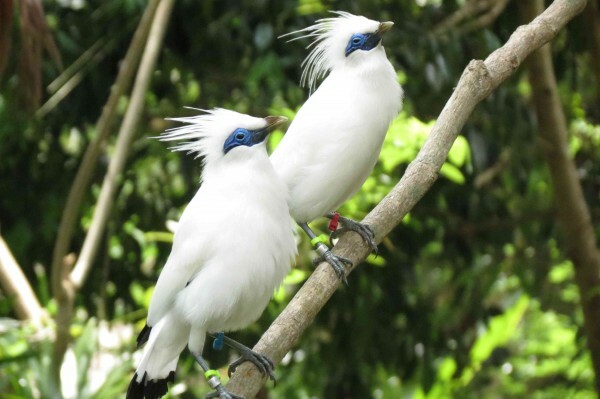 The Bali Starling Conservation Project was Begawan Foundation’s first initiative, with the goal of saving this precious bird from the very real threat of extinction. This beautiful bird was highly prized by collectors and zoos, with the result that during the 1960s and 1970s, hundreds were exported overseas, and many others illegally poached and sold. The Bali Starling was registered as an endangered bird species by CITES (Convention on International Trade in Endangered Species) in 1970. Several organisations have tried to assist in its survival, but the wild population has still not increased to a sustainable level. The major problem facing the bird’s repopulation is theft, both from official breeding facilities and from the wild. By 1991, there were around 15 Bali Starlings remaining, all living in Bali Barat National Park, however, 13 of these were released birds. During 1991, the Bali Starling became the official mascot of Bali province. Begawan Foundation began its intensive breeding program began in 1999, and today there are wild flocks on Nusa Penida and Nusa Lembongan, small islands south of mainland Bali, and a small free flock at the breeding site at Sibang, near Ubud. The GreenAsia Group supports Begawan Foundation’s activities by donating a percentage of its profits to assisting in the ongoing daily activities at its breeding centre in Sibang, near Ubud in Bali. Please look at our website and our Facebook page. We would appreciate any assistance that you may like to give us, and welcome visitors to both our breeding centre at Sibang, and the previous release site on Nusa Penida.